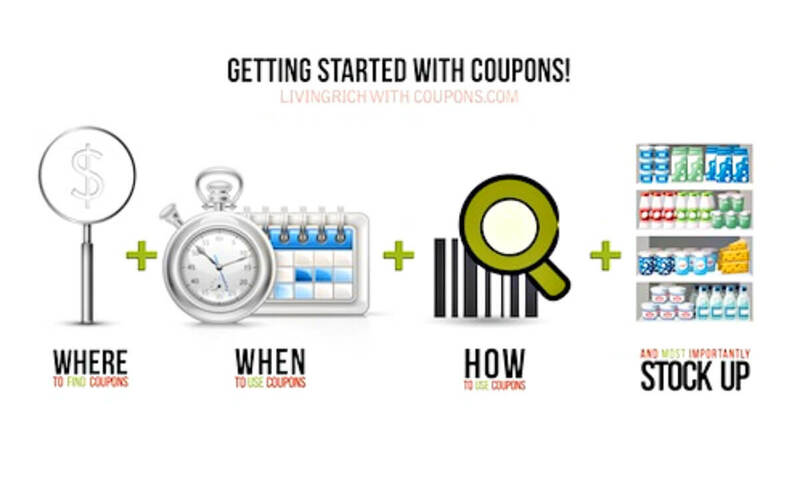 How to Get Started Using Coupons – 4 Easy Steps! Are you looking to start saving a ton just by couponing? Well, you’re in the right place! First off I highly recommend setting up a budget. Having control of your money and knowing exactly where it goes is one of the most important things you can do to secure your financial future. Six years ago when we set up our first budget, we were forced into it during a time of unemployment. One of the biggest expenses we had, besides our mortgage payments, was our groceries. We were spending over $15,000 a year on groceries. When we realized that for more than 20 years, all that money was going toward groceries, we knew we had to make a change. Actually, at that time, we were forced into making a change as we didn’t have the money to pay for our groceries and stay in our home while receiving unemployment checks. It was a difficult time but, there was a wonderful benefit that came out of it….Couponing! And, it’s changed our lives forever. I recommend using coupons and saving to anyone that will sit still long enough to listen to me. The thing I always tell them is that it’s easier then you think to get started. So, if you want to save some serious money at the grocery store, here are four easy steps to get you started. Obviously, having coupons is the first thing you need to get started. But, where do you find them all is usually the first question I get asked. These days there are so many more options to getting coupons from paper to printables to electronic coupons. Here are top 6 ways to find the best coupons. Inserts in your weekly paper – these are inserts that vary each week in your Sunday paper. Inserts are from Smart Source, Retailmenot and/or P&G. Find out which inserts are coming weekly in the Sunday Coupon Preview! Catalina Printouts – these are coupons that print at your store after checkout. We have a list of all the Catalina Deals out there! Tearpads/Blinkies – These are coupons that are found in store. You can find them on displays or hanging from the shelf. Clipping and using coupons is only the first step in saving on your groceries. Knowing when to use your coupons is what will get you the biggest bang for your buck. Wait for a sale – Waiting to use your coupons when the items go on sale is the secret to saving the most money. Don’t waste your coupons on full price items. Hang onto them for the lowest price sale and then use that coupon. Follow Sales Cycles – Sales on products usually run in cycles of about 8-12 weeks. Also, sales follow cycles of holidays and events throughout the year. For instance, snack and finger foods always go on sale around Super Bowl and candy goes on sale in February for Valentine’s Day. Follow our Grocery Sales Cycles to see what you can expect to buy during certain months of the year. Buy at the Lowest Price – This goes along with the first point which is wait for a sale. If you wait for that item to go on sale, you are able to get it at it’s lowest price, combined with a coupon and even a store promotion. Take a look at our example below on cereal to see just how much you can save by waiting for the lowest price and combining offers. Double Coupons – Does the store double coupons? If so, does a $0.50 coupon double up to $1? Does a $0.75 double up to $1.50? Is there a limit to the amount of coupons that double? Make sure you understand exactly how their double coupon policy works. Stacking Store Coupons – Make sure to ask the store if they allow you to use a store coupon with a manufacturer coupon. This is called stacking coupons. Although you can never use 2 manufacturer coupons on the same product, you can, for most stores, stack a store coupon with a manufacturer coupon. Competitor Coupons – Does your store accept competitor coupons? Make sure to ask. If they do, it’s even more of a savings opportunity. I recently found out that Harmon Discount Stores accept Ulta Coupons. Ulta Coupons are usually better coupons then Harmon puts out so now I am always saving Ulta coupons when come in the mail or newspapers. Stocking up on sale items is a very important part of getting the most savings at the grocery store. It gives you control of what you are paying for your groceries instead of the store having control of your prices. Let’s say your family eats a lot of Cheerios cereal and you were able to purchase a box for just $0.50. After 1 week, that box of Cheerios would be gone. When you go back to the store the next week, you’ll need to buy another box of Cheerios. And, guess what…it’s no longer on sale. So, you wind up paying $3.99 or maybe even $2.99 if you have another coupon. That is a big difference from the $0.50 you bought the week before. Now, lets say you bought 8 boxes of Cheerios at the sale price of $0.50 (after coupons). You are now in control of the price you will pay because you can wait for another sale. You are not forced to pay a higher price for that product since you have enough to get you through a couple of months. Stocking up does not mean turning your house into a mini market but it does mean having a stock of items that will last your family about 3-6 months. A typical stockpile will consist of products that can be stored on 3-4 shelves. That’s all you need. Find out how long certain products last on the shelf! 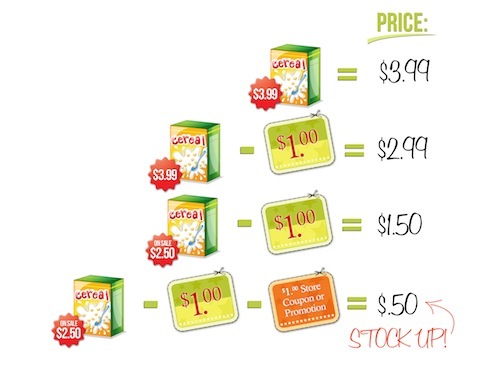 Be sure to visit the LRWC Beginners Section for even more great tips to help you save at the grocery store. New $1/1 Gardein Meat Free Coupon – Only $1.99 at Market Basket & More!